Tesla updated its online design studio tonight to drop the price of the higher-end trims of Model S and Model X. The automaker says that the price change is a way to reflect improvements in cost efficiency for the 100 kWh battery pack that is powering Tesla’s top-of-the-line vehicles. Tesla is bringing back the prices to the level they were back in April before a price increase. Though the vehicles now come with a lot more options included. The company plans to change the price of the current undelivered custom orders for those vehicles. Tesla attributed lower deliveries last quarter to difficulties ramping up production of its latest battery pack, the 100 kWh battery pack, which is the company’s most energy dense yet. Those production difficulties resulted in the new pack only being used in Tesla’s performance vehicles for the first few months of production as the company attempted to catch up with the demand for what was branded as “the quickest production car in the world“. The ‘100D’ version came later in March. While the new pack enabled record-breaking range and performance, it came with a significant premium on the 75 kWh pack, especially since they repackaged some options for the vehicle. It seems that the premium is now becoming more reasonable. 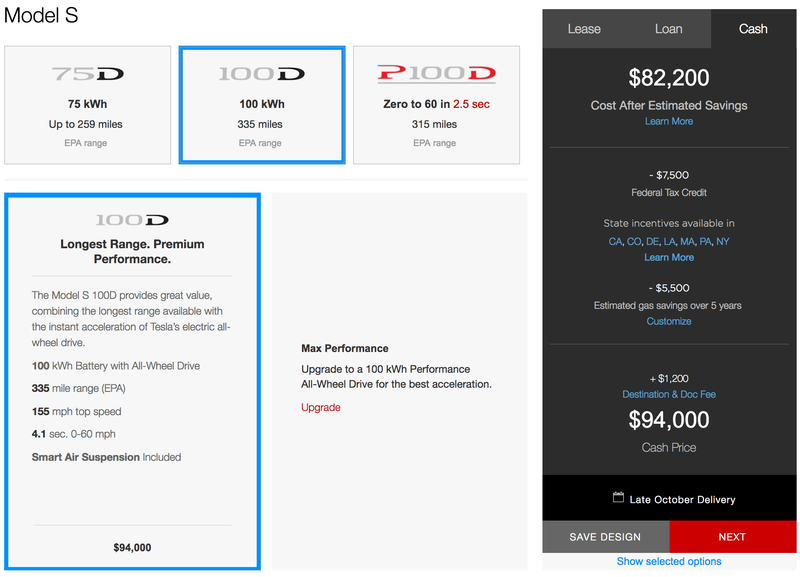 The price range of a new Model S is now $69,500 to $147,500 (before the $1,000 referral discount). While the Model X starts at $79,500 and can go up to $154,000 with all options (before the $1,000 referral discount).